In 1860, George Augustus Sala, a journalist who wrote for the Daily Mail and the Illustrated London News, paid a visit to Bethlem Royal Hospital, London’s premier psychiatric institution also known as Bedlam. Whilst there, he noted the obvious presence of animals on the wards and, following his visit, documented their ability to uplift patients and soothe the minds of the ‘unhappy persons who dwell [there]’. In particular, he commented on the use of bird song to transport patients’ minds to ‘green fields… [and] sparkling streams’. Sala’s article even included the following image, which depicts dogs in the foreground as well as prominent birdcages on the walls. Of course Sala was not the first to observe the use of animals and describe their potential benefits in medical institutions. Animals had been employed 60 years earlier at the Retreat, the Quaker asylum outside York. The Retreat was designed as a ‘home from home’ for patients and its work is still regarded as pioneering. In an attempt to create a family atmosphere for the patients, the courtyard of each ward housed animals of various sorts. These animals were largely employed as a form of distraction for the patients. 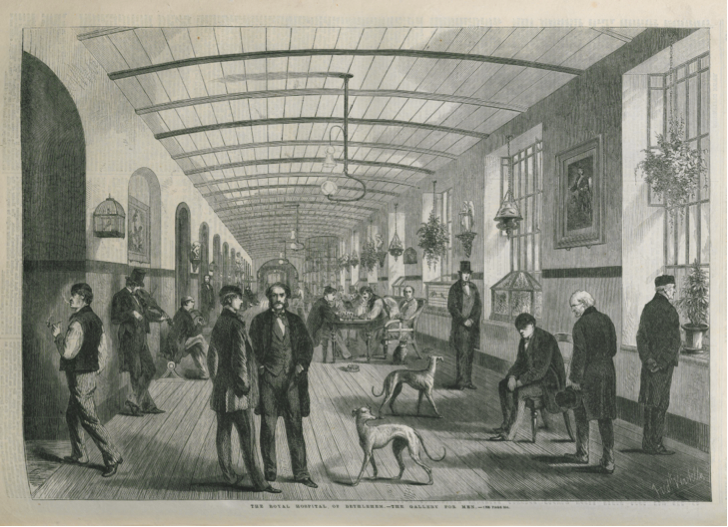 Animal use as distraction therapy in institutions led one anonymous author to comment that, due to the animal presence, the patients had ‘less reason to complain of [their] confinement than perhaps any other man in a similar situation’. This clearly demonstrates one of the earliest recognised functions and benefits of institutional animals. The role of animals in medicine gradually appeared to develop into one of companionship where the patients were able to enjoy the company of animals as their friends, rather than just as a distraction. Flora Tristan, a socialist writer, highlighted this implication in 1840. In her journal, Tristan describes a visit to Bethlem in which she meets a criminally insane patient who possessed ‘a pressing need for affection’, which had been satisfied through his possession of various animals. One article from 1900 emphasises animal use at a children’s convalescent home in Moseley, Birmingham. Its author, Reverend Sutton, comments on the ability of their ‘pet’ dog, ‘Lulu’, to interact with the patients in ‘special need of her affectionate attention’, and describes how she ‘snoodles her little black nose’ lovingly up to children’s faces. The role of animals in medicine continued to evolve with the work of Sigmund Freud. Although his use of animals is not his most well known contribution to the field of medicine, it is nevertheless an important one and his devotion to his dogs has been described as ‘psychoanalytic legend’. Freud’s most famous dog was a Chow named Jofi, whom he frequently employed in his patient consultations, often to the annoyance of his patients, one of whom commented ‘but I wasn’t paying the dog!’ However, Freud believed that Jofi ‘understood everything’, even to the point that her choice of place to sit during Freud’s consultations gave an indication of the patient’s state of mind. Although it appears that Jofi could often have been a hindrance in Freud’s consultations, her role as a patient confidant inspired American child psychiatrist Boris Levinson, who some describe as the founder of today’s animal-assisted therapy, to produce detailed reports on the benefits of animal interaction in ‘inpatient and outpatient’ settings. Levinson’s findings were originally met with scorn and distain, however, once it appeared that Freud had produced minimal yet similar work, Levinson was able to continue his research with support, which has led to the forms of animal-assisted therapy that we know today. Furthermore, at present, the ‘world is becoming more accepting of new medicines and techniques’, and animal-assisted therapy is making a significant comeback through more advanced methods, for example, the use of animals to detect cancer. The role of animals in medicine today, although different to its past incarnation, indicates that the people who initially documented the role of animals in therapy were not wrong to advocate its importance. Animal-assisted therapy has existed in at least three distinct forms for over two centuries and it appears not only to have found a central role in medicine, but also continues to evolve. George Augustus Sala, ‘A Visit to the Royal Hospital of Bethlehem, The Illustrated London News, 1860, 1023, 291-293, 291. Bronwen Gray, ‘Animals at The Retreat’ (York: The Retreat, 2012). Anon., Sketches in Bedlam or Characteristic Traits of Insanity (London: Sherwood Jones and Co, 1823), 20. Flora Tristan, Flora Tristan’s London Journal, D. Palmer and G. Pincetl (trans), (London: Prior, 1980 [f.p. 1840]), 163. C. Sutton, ‘The Pet of the Convalescent Home’, Home Words, 1900, Birmingham City Library and Archives, E/9 352343, 46-47, 46. Gary Genosko, ‘Introduction to the transaction edition’, in Marie Bonaparte, Topsy, The Story of a Golden Haired Chow (New Jersey: Transaction Publishers, 1994 [f.p. 1940]), 1-31, 1. Michael J. McCulloch, ‘Animal-Facilitated Therapy: Overview and Future Direction’, in Aaron Honori Katcher and Alan M. Beck, eds, New Perspectives on our Lives with Companion Animals (Philadelphia: University of Pennsylvania Press, 1983), 410-426, 412. Stanley Coren, ‘How Therapy Dogs Almost Never Came to Exist’, 2013 [accessed 27 Jan. 2016]). Andrew Shanahan, ‘What’s up, dog?’, The Guardian, 2005 [accessed 7 March 2016]). Anon., ‘Paddy the dog ‘sniffs out’ owners breast cancer’, 2015 [accessed 20 March 2016]).